Many towns and cities in Asia use open dumps and only a small volume of solid waste ends up in properly engineered and managed landfill sites. Photo credit: ADB. A town in northeast Thailand looks into the feasibility of a design-build-operate scheme for developing a controlled landfill site. Like many municipalities in Asia, Mahasarakham town in the northeast region of Thailand faces the massive challenge of escalating volumes of solid waste along with deficient landfill infrastructure, technical skills, and regulation. While Mahasarakham does have formal and informal waste collection, the municipality’s landfill site runs as an uncontrolled dump posing significant threat to surface and groundwater. The Asian Development Bank (ADB) provided technical assistance on mainstreaming solid waste management to Mahasarakham and four other cities in Asia. Key assistance was a review and upgrade of municipal 10-year plans for solid waste management plus one tailored project per city. Issues covered were waste avoidance, minimization, and recycling; waste haulage and disposal; and information, education and communication campaigns. In Mahasarakham, after consulting stakeholders, the project team and the municipality developed and agreed on an enhanced integrated solid waste management plan. Due to strong interest from the municipality, the project team also conducted a pre-feasibility study into how the private sector could fill the technical gaps required for developing a controlled landfill site. A key element of the project was the series of meetings with private providers to gauge interest in in design, remediation, construction, and operation of a controlled landfill site through a public-private partnership. The landfill in Mahasarakham town operates as an uncontrolled dumpsite. Employees demonstrated low technical knowledge of how a controlled landfill site should operate. 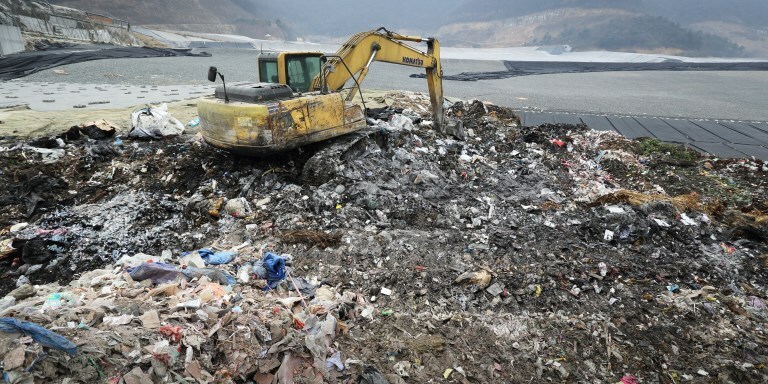 For example, the majority of the site had uncovered waste placed at very flat slopes, which generates landfill leachate and associated hazards. Leachate was observed flowing off the dumpsite perimeter onto neighboring properties. More specifically, when developing cells at the site the operator has constructed a perimeter of earthen bund, which has the potential to form a large dam. At the time of inspection, in the dry season, it was already partially full with a large volume of landfill leachate. The problem of leachate will be exacerbated if the approach to developing a series of enclosed bunds and then a plateau mound with a flat top continues even if suitable final cover is applied. Leachate will contaminate local surface waters with potential to pollute local groundwater reserves. There are also many areas where waste has been placed in an uncontrolled manner resulting in areas of exposed waste throughout the site. While the current landfill design and operation are creating extensive environmental problems, discussions with operators and managers indicated that the city would not be able to run a controlled landfill to an appropriate standard without ongoing external support. In addition, the city has a priority to minimize the quantity of residuals going to landfill. City officers expressed interest in converting waste to energy, particularly refuse derived fuel or RDF as a possible method of diverting waste. This is a process in which waste is separated and prepared to “RDF 2” quality then transported and sold to modern cement kiln owners that buy it as a coal substitute for the heating process. The pre-feasibility study confirmed that solid waste management challenges would be best addressed by a private contractor taking full control of operations and being compensated for construction, remediation as per agreed milestones, and for operations on the basis of fee per ton of new waste. There would be a deduction if the private operator failed to achieve specified performance targets. This ensures that a fixed price is agreed upon for construction and remediation costs and that there is year-to-year stability in the operating budget. The study included a scope of works for a private contract, including design for the remediation of the existing dumpsite, accepting new waste on a daily basis, and design and development of a new controlled landfill. The remediation works would require the waste to be re-profiled, compacted, and covered with soil while it waits to be incorporated into the controlled landfill. The controlled landfill design would involve the development of a suitably profiled valley formation for the first cell, complete with a suitable impermeable liner and incorporation of leachate collection drains. Leachate would then be directed to a pump station from which it would either be irrigated in dry weather or reinjected/stored during the wet weather periods. The design would allow for the entire landfill site to eventually be integrated into one mound to maximize site airspace efficiency, as well as cost recovery efficiency for the capital works. It also has the added benefit of maximizing the incorporation of steep batter slopes on the site, thereby minimizing rain water infiltration and greatly reducing leachate generation rates. Under the municipality’s 10-year integrated solid waste management plan, the city will complement the public-private partnership activities with extensive information, education, and communication campaigns to help reduce the amount of waste reaching the landfill. Under the integrated solid waste management plan, Mahasarakham will enhance its waste minimization program through a range of IEC campaigns. These will include promoting the use of biodegradable bags and food containers and the 3Rs – reduce, reuse, recycle and segregating waste. The valuable segregated waste can then be sold. The new plan allows for controlled scavenging at controlled landfills because this attains a high level of recycling efficiency. The municipality will consider increasing waste collection and disposal fees along with proposed national legislation and apply the extra revenue to ongoing waste minimization campaigns. The municipality will reduce food waste going to the landfill through the promotion of organic waste composting by households. This will significantly reduce wastes generated per day because food waste makes up a large fraction of municipal waste. Mahasarakham recycling eWaste facility. Photo credit: Lyndsay Chapple. The sales and marketing teams of RDF companies were convincing municipalities in Thailand that refuse derived fuel is an economically feasible solution. The project team met with some of these companies to present the results of a pre-feasibility study from another project city, Buriram. The companies then admitted to the Mahasarakham officials that their proposal was not economically feasible under present conditions. This approach of presenting quality data to marketing teams was very successful. It could be adopted in other cities to explain the realities of implementing refuse derived fuel and waste to energy projects. The current landfill design requirements in Thailand limit the mound height to effectively four lifts or 10 to 12 meters. This greatly reduces site development efficiency in terms of airspace per unit area, and therefore increases the development costs and reduces landfill life. This approach also results in flat top landfills, which increases leachate generation rates that may lead to environmental issues. The project team presented this issue to the most senior members of Thailand’s Pollution Control Department and recommended the restriction be removed to improve landfill life, cost efficiency, and minimize environmental impact. The major lesson was that a public-private partnership would be the most effective way to improve landfill design, remediation, construction, and operation. The private sector would bring the essential skills and knowledge to improve landfill development. The municipal officers and the private sector operators supported this recommendation. Asian Development Bank. 2017. Integrated Solid Waste Management for Local Governments: A Practical Guide. Mandaluyong City. Lyndsay Chapple has worked in solid waste management for more than 3 decades. His expertise covers all aspects of solid waste management, ranging from environmental assessments to detailed design of facilities. His passion is developing site-specific solutions that are pragmatic and sustainable. Andrew McIntyre heads the project administration unit of the East Asia Urban and Social Sectors Division at ADB. Earlier, he led ADB’s Future Cities Program, operationalizing a One ADB approach to better engage with Asian cities over the long term, by facilitating cross-sectoral knowledge and financing partners, broadening project pipelines, and ensuring integrated results.